Early spring in the mountains of the northeast usually means there is still a layer of snow on the ground. The melting snow is soft and slushy. The sunlight is bright and golden, robust enough to bring forth new life. Not like the brittle, fragile light of high winter – fleeting and gone so early in the day. The air is cool but not cold. It is a good time for wearing just a shawl. A shawl that you can wrap around to leave your hands free for work by tying it at your back. The corners are long enough so that you can wrap the shawl around your waist and tie it in the back – leaving your hands free. Oona likes wraps and old-fashioned things and so I made this springtime shawl for her. 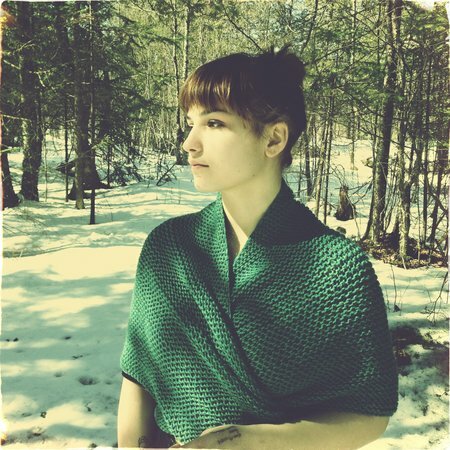 Knit & crochet designer Kay Meadors very generously makes her Tess of the d’Urbervilles Shawl pattern available for a free download on Ravelry (if you knit and you aren’t already a member of Ravelry, do it, you’ll love it). I used a machine wash & dry pure wool yarn – Cascade 220 Superwash. The color is Spring Night. It was a fun and easy shawl to make. 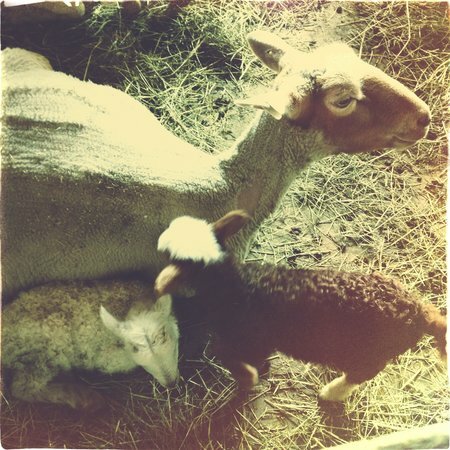 Early spring also means newly shorn sheep and new lambs. These twins are one day old here. 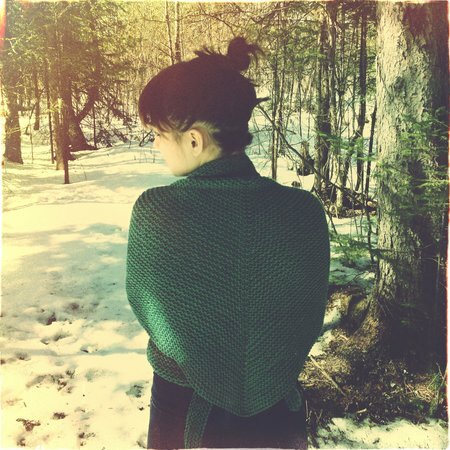 The photos were taken with the Hipstamatic app using their new Mabel lens and Dixie film. This entry was posted in knitting and wool projects and tagged cascade superwash yarn, easy shawl knit pattern, Tess of the D'Urbervilles Shawl pattern by ileana. Bookmark the permalink. Margi, I’m so happy you are a reader! Thanks for this note, it made my day. You should know that Millie is fantastic and she has a fan base here. I get emails from people asking about her. Hi Elissa, thanks for your note. So nice. If you knit this, use the Cascade yarn, it is a little bit springy (forgive the bad pun), so that you can tie it without stretching it out of shape. Oh! And Oona is such a beautiful Tess! All the best.